Sponsored conversations are happening, yet we insist on it being done right and ethically, that means disclosure and being authentic. This post, which I’m updating frequently, will serve to show there is a long history of sponsorship, the many forms of sponsorship, and an ongoing list of these transactions. I make lists to track what’s happening in my industry, in fact, you can see many of these famous lists on the ‘industry index‘ category. While some are taken aback by companies sponsoring conversations, I’m going to list out many brands and bloggers that are involved, this is clearly not going away. Some of these examples get very gray, it’s hard to tell where the editorial line starts and stops, or would these bloggers have talked about a brand if they weren’t sponsored? Our solution is simple: they must meet the requirements of disclosure and authenticity we recommend. It’s important to see where sponsorship has come from, in order to see where it’s going. I added this section later as it gives more context. Sports: Nascar slams more brands on a car, they know that TV airtime during aired events will imprint the brand on consumers. Athletes are often sponsored, one notable example is Tiger woods and Accenture. Search: A few years ago, when ‘sponsored search results’ appeared in the editorially clean search results, it caused an uproar from the community. Now, it’s part of life. There’s a wide range of how brands and bloggers meet in a transaction. Consider this section a work in progress, and I added after I published this post. 1) Access : Blogger is sponsored, Example: A brand sponsors a blogger trip, or conference. Example: Wal-Mart sponsors bloggers to visit HQ, but does not pay them anything else. 7) Junket: Bloggers are treated to a special dinner, event, trip or lounge at a conference, event, or other venue. Branding may range from light sponsorship, product demos, to PR pitching. Example: Blogger trips like what Israeli Foreign Ministry or blogger lounges like BlogHaus. Often transparent, but credibility could be questioned if product is involved. 8] Payola : Bloggers are paid to blog, but are not mandated to disclose or be authentic, in fact, the FCC has rules on this, and Forrester is against this. This list, which will grow from community submissions and shows a variety of sponsorships: The gambit ranges from product giveaways, contests, shopping sprees, reviews, discussions, advertorials, to endorsements. Read Write Web: While against the premise of paying bloggers, has a blog post in their blog editorial stream written by a paid sponsor. It meets the requirement of disclosure and authenticity, they’re one example of doing it right. Mashable: I want to point out that some of the other large tech blogs that have conferences, often do a ‘thank you’ post to their sponsors. While it’s clear this isn’t to trigger a discussion, the sponsored vendors are called out in the editorial stream, with marketing hyperbole intact. Techcrunch: While this clearly is not an endorsement, vendors are mentioned in the editorial stream to thank them for sponsorship, which is separate from the advertising column, as you know, this site has incredible influence in SEO and traffic. This is pure in transparency and authenticity. There’s been some discussions whether or not Techcrunch writers have been involved in sponsored conversations, it’s not clear to me if it’s true. Blogher: Dozens and Dozens of brands from Bertolli, Sesame Steeet, Leapfrog, McCain Foods, Merci Chocolates, TNT, Bare Minerals, VTech and others offer giveaways to bloggers at this popular women’s blogger conference. Note: not all of the giveaways were products, but some were the usual conference schwag. Julia Alison: a NY socialite, much like a celebrity is available for $517. Brands have been sponsoring celebrities for years, now it’s just online. ZDNet: As listed below under HP, Dana Gardner’s analyst content is sponsored by HP with full disclosure. Mashable: has created a way to insert sponsored tweets into a twitter widget, they’re monetizing twitter in a transparent way. Magpie has been experimenting with inserting ads in the Twitter stream, while not truly ‘sponsorship’ it’s inserting it right into the conversation stream. See my experiment. Sponsored Tweets: Izea (formerly pay per post) has launched Sponsored Tweets. Kim Kardashian, Chris Pirillo, and Carrot Top are among those who will be paid to Tweet. Seagate: Robert Scoble’s Fast Company show is sponsored by Seagate, and he toured a factory in China, give away seagate products, and mentions them from time to time in his blog. Panasonic: Sponsors Bloggers like Chris Brogan to attend CES on their dime, and a conversation spreads to many social sites. Disney: Worked with influencers and sponsored conversations for paid movie reviews that they’ve released. WalMart: creates a section on their website for 11 mom (and Dad) bloggers. They are not paid, but their travel expenses were paid to visit HQ, and they are given products to review, and to give to their readers. Sears: Gives away $500 gift cards to bloggers, who can also give another $500 to readers. Kmart: Sponsors bloggers to visit its stores and shop with gift certificates, then share another gift card with their readers and has success. One blogger, Chris Brogan took a lot of heat for it. Microsoft: This one was under scrutiny. This was an early example, but they sent one of their top “Ferrari” laptops to top bloggers. Some, like Scott Beale chose not to keep it. Microsoft: This campaign was slammed for not being authentic. Hires Federated Media, a network of top blogs, who recite a slogan from a Microsoft campaign, this one was controversial and included many top bloggers, even a VC. Nikon: Let’s blogger photographers borrow their DSLR cameras, but they have to return them or buy them later. M&Ms: has a chocolate product giveaway to this blogger and her readers. Hewlett Packard: Provides the Blogher community a printer, that resulted in 227 comments. Actually Angela from HP says the results were much greater. Hewlett Packard Sponsors Zdnet Dana Gardner’s blog and podcast. Dana, who’s a trusted IT analyst is sponsored by HP and provides full disclosure. JCPenny: Offers bloggers a $500 gift card for Blogher bloggers to share their shopping experience. Mercedes: Let a mother who blogs use Mercedes GLK, and gift certificates were given to readers each day. Quaker Oats (Pepsi) According to Ryan Stern in the comments, Quaker Oats had a contest for recipes and gave product to bloggers. VMware: According to John from VMware in the comments, VMware sponsors bloggers to attend their conference, and advocates receive gifts. White Pages: Reached to David Berkowitz as a sponsored blogger as they invited him to Seatlle. American Express: AMEX has Guy Kawasaki as a guest blogger on their OpenForum community site, it’s not clear if he’s paid, but his editorial is in line with all the rest of his content. Intel: This chip giant wants to reach tech adopters and influencers, esp those that talk among each other, as a result they’ve sponsored projects for these communities at Digg (visualization tool that resulted in buzz) and a conversation and Slashdot (I don’t have a link, but was briefed by the team). SAP: Tech giant sponsored interviews from Shel Israel, who was conducting interviews on the topic of social media. This was a perfect example of sponsorship as it was disclosed and transparent, and Shel’s editorial was never changed. Kohler: Kohler worked with Federated Media to create this H20 blog to discuss using sponsored bloggers from the FM network. HP: Created a resource site called SMB Marketing Guide and featured a variety of prominent bloggers from the FM network. Google: Google Japan paid bloggers to review their widgets, and true to Google’s stance on sponsored posts, penalaized their own arm from a page rank 9 to a 5. Nokia: Has a blogger relations program where 50 bloggers received their latest N95 phone. Roger Smith Hotel (NYC): Offers a blogger special discount, encouraging bloggers to stay at the hotel –and even get upgrades. Cheetos (Fritolay/PepsiCo): While looking more like an ad, this blog post on Mashable shows the Cheetos logo and encourages comments in the conversation. they also sponsored Boing Boing creators to produce some entertaining videos. SeaWorld: Bloggers were invited to try to blog about why they would want to go to Seaworld, in this blogging contest. Lenovo: Lenovo’s head of Web Marketing has clear lines about where sponsored conversations start and stop suggesting that payola wrong, product giveaway ok. However Lenovo, provided free laptops and cameras to olympic bloggers to use to share their story, and created a sponsored site where their voices are heard. Appears to be transparent and authentic, this is a good example of a sponsored conversation. General Mills:General Mills offers up to 900 bloggers product reviews and are not paid, through this very large program. AdWeek explores that while bloggers can write anything they want, the program seeks positive reviews. Sprint, TNT, Powerbar, Body Glove, Showtime, Colgate, Coca Cola. Social Vibe is a vendor that allows sponsors to connect with users, who will promote a campaign or cause on the social vibe site and on their social networking profiles. 1928 Jewelry: While not a large brand like the ones above, 1928 Jewelry sponsored a giveaway to bloggers and shares her results, see comment #1 below. Special Case Study: Google: Google’s Matt Cutts will penalize blogs that are doing sponsored conversations he insists those that don’t use the ‘no follow’ tag will be penalized. Interestingly, Google sponsored Blogher in 2007, and Blogher did a sponsored post thanking them in their editorial stream, with marketese, and did not use ‘No Follow’. Will Google penalize Blogher, who they paid for sponsorship? Where does the line start and stop? Update: Google Japan has paid bloggers to review their products –and was penalized by their own company. It’s clear that bloggers that care about page rank need to use ‘no follow’. There will be plenty of other examples to come, if you know of large brands or popular blogs that are doing this, please leave a comment with a URL. Sponsored conversations, although controversial, aren’t going away. In fact during recession, they will likely increase. Update: See this growing list of bloggers and brands that have participated in sponsored conversations. Despite the demand that brands desire to reach communities, and bloggers desire to monetize and help their community, it’s important this transaction is done ethically and is sustainable for the long run. People get very emotional about this topic, so before you comment, twitter, or blog about these changes, first read my entire post, then Sean Corcoran’s to get the whole story. How controversial is this topic? very. In fact, I previously highlighted both the opportunities and risks when I twittered and blogged about Kmart’s sponsored blogger hit the social sphere, which resulted in a flurry of discussions. “1) sponsorship transparency and 2) blogger authenticity. Even with these in place, this isn’t right for every brand nor blogger. Some brands, that already have a natural conversation in the market don’t need to reach these influentials. Secondly, this isn’t right for every blogger, as to be authentic (and therefore sustainable) they should only participate in discussions that match up to their editorial agenda, are believable by their community, and don’t jeopardize the trust with readers. One challenge bloggers will grapple with is they primarily talk about topic X, then switch to a paid topic Y, some may readers may question the credibility –even if they find a different venue on a different blog. I learned from Izea that Seaworld has paid bloggers to attend their park in Florida and paid their expenses, but not cash. They were also awarded a free pass to award their readers. For a couple of years now, Seagate has sponsored Scoble’s Fast Company show, which gets mentions from his blog, in which he visited their factory in China. I learned from Crayon that they worked with Panasonic who paid travel and expenses for bloggers to attend CES, with full disclose. I met with Blogher last week and found out that Symantec worked with bloggers to offer products for paid reviews, with disclosures up front (yet not in the normal editorial stream). However, not all conversations need to pay bloggers, in fact WalMart to learn how they created a blogging network for mom and dad bloggers –without paying them, except for expenses to visit their headquarters and products were provided to review. Update: I’ve started an ongoing list of sponsored conversations, many of the brands –and blogs– you’ll recognize. Not every brand is doing it right, I’ve seen some examples where the disclosure isn’t fully apparent, or is hidden in the language, so bloggers, and blog networks, need to do a better mandating transparency and authenticity. While ethics are certainly at play, by not disclosing, it erodes at the ecosystem, and will make the model unsustainable. To appropriately close with disclosure and transparency, in case you’re new to this blog, I’m an employee at Forrester Research, and I stand by the report we published. I’ll be updating this section as I see voices that add to the discussion –not just rehash. Ted Murphy, the CEO of Izea, and primary instigator of paid blogging, shares his thoughts, when he first started this, disclosure was optional, and now they’re following a code of ethics. 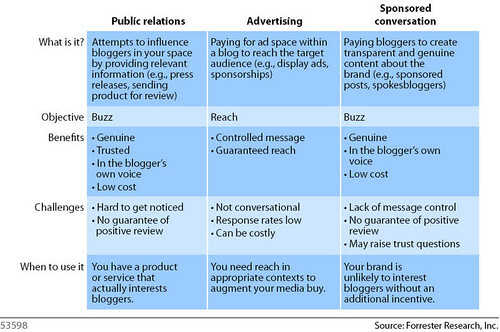 Read Write Web: Forrester Is Wrong About Sponsored Conversations. We respect RWW, and welcome Marshall’s interesting perspective, except that they prove our point as they have transparent sponsored blog posts from advertisers in their own editorial stream. Matt Cutts from Google reminds all sponsored bloggers the dangers and impacts of doing sponsored blog posts. He says “My bottom-line recommendation is simple: paid posts should not pass PageRank.” In our conversations with Ted Murphy of Izea, he says he gets around this by using “no-follow” in his linking. The smart folks at eConsultancy point out the dangers –and solutions— to search engine marketing with sponsored conversations. I point out in the comments that IZEA has already worked this out, although other blog networks haven’t. Adweek weighs in: ‘Influencer Programs’ likely to spread. Search Engine Journal chimes in with some thoughtful questions around the impacts to search. Joseph Jaffe, a Marketer who organizes sponsored conversations as well as participates in them gives his point of view. Jason says that bloggers need an oath, beyond transparency and authenticity. Broadstuff says we got it wrong, yet the ultimate test is on the bloggers and brands –we agree. Ad Week: Points out that the no follow rule is key for sponsored posts, AND Google is enforcing this. Ogilvy’s John Bell points out there’s a difference between word of mouth and paid media, good points. Our research indicates that 2/3rds of US online Youth (ages 12-17) use social networks at least monthly, and 20% of teens use them daily. (Q4, 2007) There’s no indication that I’ve seen that the adoption will decrease as they enter the workforce. David Churbuck (whose name I finally got right) is a web strategist at Lenonvo computers, and writes a compelling piece Does Your Company Have a Blogging Policy? This is a question I hear to often from the Fortune 5000 who are toe dipping, or just down right scared of employee blogs. I often defer the conversation a step higher, to discuss how they’ve (hopefully) hired smart people that they trust, and that they are willing and to empower and trust them to make the right decisions both online, and offline. In many cases, some of these companies have over-arching ethics policies that span behavior not just on blogs and social networks, but also at corporate functions, or even when wearing he company shirt at a bar. Sadly, more than one company has expressed to me they didn’t trust their employees, as either they were an “unruly” group (many of their employees in the field may not have much formal education) or were uncomfortable with how much of their personal lives they shared due to their age (Gen Y shares quite a bit in MySpace and Facebook). At a more traditional and larger brand, this company wanted to attract more Generation Y and X employees, as over 40% of their workforce (Boomers) are starting to retire in the next 5 years. The fat pensions they’ve been building for the employees has made it quite affordable to retire early –taking their knowledge and networks with them. So to them, they had to be friendly to social media when it came to attracting this younger crowd, and they softened up on their corporate social media policy. Recent research by Deloitte confirms that Gen Y seeks to give back to their community, often in the form of social networking. So how are companies stringing together these policies? Most commonly, the ethics policy is already in place, and corporations can lean and amend that one. A few have adopted a specific blogging policy, often with the help of the actual bloggers, while a majority may be too decentralized –or not have anyone focusing on it — to create such a policy. Share with others, if your company has a public blogging or social media policy, please leave a link to it below, and tell us how your company came into agreement for this policy. In my recent post, I write about how our industry is starting to solidify and come together. This conference, blog world expo in Vegas is more like a trade show, and we’re seeing constituents from many parties, we’re growing. It’s really important that we hold ourselves accountable, especially our leaders. (Update: We hope Om, who hurt his back feels better). As an industry, we look up to these leaders to set a good example, they influence the behavior of others who read them, watch them, and are in their space. Some fans in the space are let down, and I can understand why. Also, I heard that some speakers were pitching their services. We, I, you should call speakers out when they do that, and respect the time of the audience. As our industry grows and solidifies, (as I was telling Chris) we need to be accountable to ourselves, each other, and the industry, no one person is greater than the whole –that is, after all, what the web is all about. I’ve worked for a few companies now in my career, and each culture exemplifies it’s trust for it’s employees in different ways. For many companies, there’s a long list of do’s and don’t that are issued to them while they’re being hired. The more “donts” the less trust the company and employee may have. In this new world, where Social Media is going to be part of many of our communication fabrics, we need to establish trust, as the lines are never going to be fully black and white. 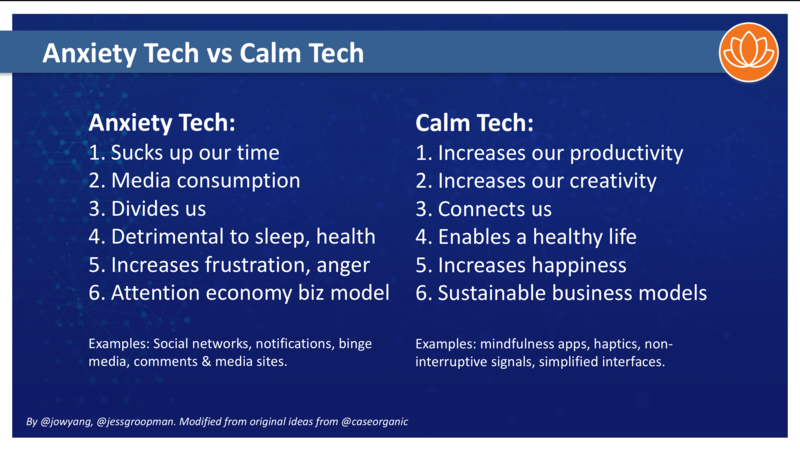 Those who embrace these tools will often be ‘pushing the membrane’ of the corporate culture and as a result, be in the gray zone. Keep in mind, those who push are often wanting to help customers, or move the company in the right direction. 2) Companies: Trust in these employees to be your ambassadors to the world, give them the benefit of the doubt, and let them self-correct amongst themselves. I also advise instituting internal communication tools to help them, and setting down basic guidelines…often created BY the employees. 3) Employees: Those out in the social sphere should act their best, demonstrate your ability, and try not to embarrass the company. If you do make a mistake, quickly apologize, correct the mistake. Always act in an ethical manner. 4) Social Sphere: That’s everyone else in the world, is to simply recognize the challenges as companies move forward in this new world. I’m sure there’s an argument suggesting that the mail clerk shouldn’t blog about the company’s product set, which is likely appropriate, but keep in mind, he’s connected to his network on MySpace or Facebook, and represents the company in a different way –even if he attempts to separate himself from the company. What prompted this post? yesterday, the message I heard from my new employer at orientation was “We trust you, as we hire good people”. Message heard loud and clear.